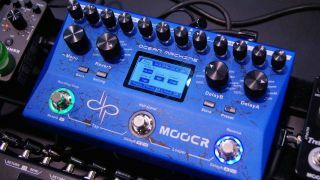 NAMM 2017: It's been a long time coming, but Devin Townsend and Mooer's all-encompassing delay, reverb and looper pedal, the Ocean Machine, is finally here. The stompbox took pride of place at this year's Mooer booth, and we were given a tour of its myriad features before sitting down to spend some quality time, one-on-one. In its default mode, the Ocean Machine's three footswitches turn two independent delays and a reverb on and off. 17 delays and nine reverbs are available to choose from, adjusted via the controls at the top of the unit. The pedal can also be set up in preset mode, with 24 spots available to save sounds. We were impressed by the detail available from its small screen right from the first boot, which displays the Mooer and Devin Townsend Project logos. Basic operation via the top-panel controls is straightforward, with an impressive array of sounds on offer - the usual analogue, tape and digital sounds are there (complete with onboard tone controls), along with modulated types, plus Crystal's shimmers and Rainbow's discordant shifts. Reverb, meanwhile can get as trippy as you like, with phase and flange-enabled types, while a dedicated shimmer knob dials in pitch-altered versions. We were pleased to note that the quality of the shifting is far superior to previous Mooer pitch pedals, and while it's perhaps not as refined as similar sounds from the likes of Strymon, it had no problems tracking extended chords during our playtest. Delay times can be set in various subdivisions, and both delays can be rhythmically linked to provide syncopated patterns, while the delay and reverb can also be frozen for infinite trails. What's more, the pedal offers the ability to set reverb types so trails aren't cut when you change types. The Ocean Machine's looper offers up to 60 seconds of recording time, which isn't as much as, say, Boss's DD-500, but will be sufficient for all but the most dedicated of loop friends. Meanwhile, DL4 fans will be thrilled with the stellar sound quality of the half-speed and reverse functions. Accessing the pedal's various menus and functions requires a fair amount of familiarisation - something we didn't quite have time to do given our limited time on the show floor - but anyone keen to get the absolute most out of it would be advised to invest in Mooer's forthcoming C4 wireless controller, which can be assigned to control tap tempo and looper functions. It connects to the Ocean Machine via a 2.4Ghz wireless link, so you can easily stick it on the floor next to your pedalboard, too. It's difficult to get into too much detail here, but from our time with the unit, we can confirm that the tones are top-notch and the features exhaustive. We'll need to sit down properly with the unit when it's released in late March/early April to assess how easy it will be to use live, but given the many months Devin spent honing the pedal with Mooer, we're sure it won't disappoint here, either. What is for sure is that Mooer's Ocean Machine - along with its 10 new mini guitar preamps - will be the pedal to propel its maker into the FX world's big leagues, especially with a price tag of $299-350 (around £250). We can't wait to see what this increasingly innovative Chinese company does next.